Coals stocks at major power plants could run out in one or two days,the China Daily newspaper has reported, suggesting more blackouts are likely. 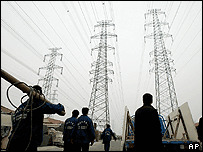 But the National Development Reform Committee's (NDRC) Energy Bureau said it was working on increasing supply. Energy Bureau director Xu Dingming told state TV: "As the person in charge of the energy sector, I am concerned." Almost all Chinese provinces have been hit by chronic blackouts and power rationing during the first three months of the year. Only the remote Xinjiang Ugyur Autonomous Region, three provinces in North East China and Hainan Island have been unaffected so far, China Daily said. In an interview with China Central Television, NDRC officials admitted that an electricity crisis was looming as a result of dwindling thermal coal supplies . However, they said supplies were adequate and blamed abnormally fast growth in demand for the shortfall. The country's rapid economic development is behind the problem, with industrial power accounting for three-quarters of consumption. Official figures show that during the first four months of 2004 coal output increased by 16.2% year-on-year to 469.3 million tons. But during the same period, electricity generation surged 15.8% compared to the same period last year. Experts have warned that power shortages will worsen in the summer as more people begin to use their air conditioners. The NDRC has moved to control demand that is outstripping supplies by raising peak rate tariffs, lowering night rates. It has also altered factory work schedules to balance consumption between day and night. Meanwhile, it is also attempting to boost supply by building more power plants and by investing $2.27bn dollars into revamping China's eastern power grid. But, the report in the China Daily newspaper said the measures may not be enough. It said that while the bureau will begin the construction of plants with a combined capacity of 30,000 megawatts this year, China will still remain short of capacity by 20,000 megawatts this year - 5,000 megawatts more than 2003's shortage. NDRC deputy director Wang Jun warned: "We cannot meet demand by only increasing production." Instead, he said, energy saving and conservation measures could reduce demand by 10,000 megawatts. 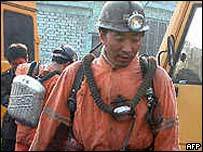 Much of China's coal is mined small, inefficient and dangerous mines where fatal accidents commonplace. In Shanxi province, two separate mine accidents took 24 lives on Tuesday, China Daily said in another report.